First, note that you can have as many registrants for your event as you like. The only limitation is for live attendees. This article we will teach how to share your webinars, invite people to register and share some tips to maximize your registrations. Also, bear in mind that sending invitations WILL NOT bulk register people to your webinars. They need to register and actually opt-in to your webinars. Our Terms of Service do not allow using invitation emails for other purposes than inviting people to your webinars. Any other use could result in permanent account deletion and IP ban. The easiest way to invite someone to your event is to share the link to your registration page. You can share it wherever you want: social media, emailing, adverts, etc. Note that you can share the permalink that is located under the "Share webinar" block of your registration page. The link will still be valid even if you change your webinar URL for instance. Pro tip 2: by adding UTM tags in your URL you can track the source of registrations (details here). This way you will know if your attendees come from Twitter, Facebook or any other source. You can even hack the UTM tags to pass user IDs to distinguish leads and actual customers. There's also a built-in invitation feature inside Livestorm . You just have to go to your webinar dashboard and click on "Email invites" under the People tab. For now you can send out the invitation to the same email address only once, so please bear in mind that it's not possible to relaunch invitations for the same address. You can send 2000 invitations per webinar. If you want to send more invites, we recommend you to use a dedicated emailing software (like MailChimp for instance) and just include the link to your registration page on it. After sending out the invitations you can track the invitation status in the invitation table. When they click on the link, they'll be redirected to the registration page which will display the closest session. The visitor has the option to display all upcoming sessions on the same page. The same rule applies when you share the URL of your recurring webinar. When a visitor clicks on the shared link, the upcoming session will be displayed automatically for registration. The company page is a macro view of all your upcoming and past events. It is enabled by default on your account but you can turn that off. However, this page is great if you don't have the time to build a proper webinar page, it is always up to date and synced with your webinars. 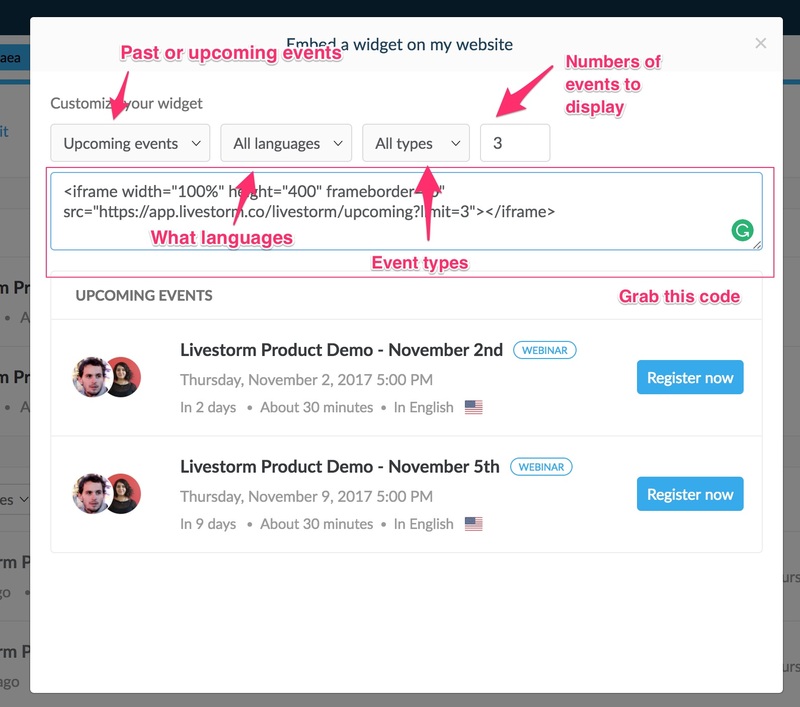 If you use the widget you will be able to embed your upcoming events for example anywhere you like: a blog, a WordPress, your website, a forum, and admin section. Anywhere where you can iframe widgets. Also, if you play with the height/width you will be able to modify the layout of the widget to make it fit on a sidebar for example. Include a link to your nav on your website. Put the link in your onboarding emails/messages. Include the widget in your blog sidebar. Include the widget in sections inside multiple pages (you will find our event sections on our home page, "features" page, etc.). Occasionally, you can even embed the widget for a specific webinar on any page of your website. Just like the company page widget. This is perfect to capture registrations directly from your website. So typically, you could write a blog post about your upcoming webinar with this big influencer and add the widget for that webinar inside the blog post. Of course, you can add a completely custom page using Instapage or Hubspot and get registrations from there. To do it we recommend reading this post.